Youth Minister Emmalin has given the assurance that the financial donation from the Foshan City Government to the Imani Programme will be used to offset tuition cost for those undertaking studies at the T A Marryshow Community College. 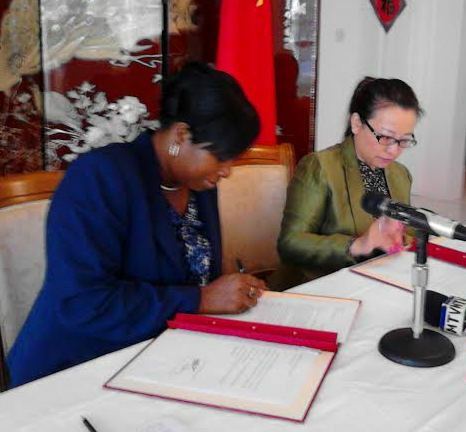 Chinese Ambassador to Grenada Madam Ou Boqian presented the donation to Pierre on 27 November during a short ceremony at the Ambassador’s residence. It was explained that the during the month of August, Mai Jiehua Vice Mayor of Foshan City which is the Chinese city twin to St George’s visited the island and during discussions Amb Boqian explained the importance and need for support to the IMANI programme. “She promised she will help and today we are here presenting the cheque of to the Minister. The major understands the importance of youth development as they are the future,” said the Ambassador in handing over the financial donation of US$18,000. Pierre said that the assistance will go a long way in executing the programme as there is a component which encouraged young people to pursue and achieve tertiary education. “We continue to see you a friend and this presentation is a symbol of the friendship which exist between both nations,” she said.